The short ball end hex keys in this 13 piece SAE set are made from premium S2 steel for superior durability and corrosion resistance. Gray hex keys deliver up to 33% more torque than ordinary hex keys. Backed by Gray Tools worry-free lifetime warranty. Contains Sizes: .050", 1/16", 5/64", 3/32", 7/64", 1/8", 9/64", 5/32", 3/16", 7/32", 1/4", 5/16", 3/8". Made of premium S2 tool steel for superior durability and corrosion resistance. Deliver up to 33% more torque than ordinary hex keys. Keys 1/8" & 3mm and larger have size permanently laser marked on the key. Ball end design offers greater access to fasteners from different angles in hard to reach applications. For warranty details, please call 1-800-567-0518. The retaining ring pliers in this 2 piece set convert from internal to external or vice versa, when pivot switch is moved to adjacent tapped hole. Fixed tips are precision formed and hardened for accurate fit and long wear. Large cushioned grips are engineered to reduce fatigue. Made in USA and backed by Gray Tools worry-free lifetime warranty. The convertible retaining ring pliers in this 3 piece set convert from internal to external or vice versa in seconds. Quick adjustment knob allows user to switch from internal to external without removing or tightening screws. Fixed tips are precision formed and hardened for accurate fit and long wear. The set includes convenient plastic storage case. Made in USA and backed by Gray Tools worry-free lifetime warranty. The pliers in this 4 piece general maintenance set are drop forged from specially chosen tool steel for superior strength, flexibility and longer tool life. Precisely machined serrated teeth provide a safe and secure hold of any object. Made in Germany and backed by Gray Tools worry-free lifetime warranty. The convertible retaining ring pliers in this 6 piece set convert from internal to external or vice versa in seconds. Quick adjustment knob allows user to switch from internal to external without removing or tightening screws. Fixed tips are precision formed and hardened for accurate fit and long wear. The set includes convenient plastic storage case. Made in USA and backed by Gray Tools worry-free lifetime warranty. 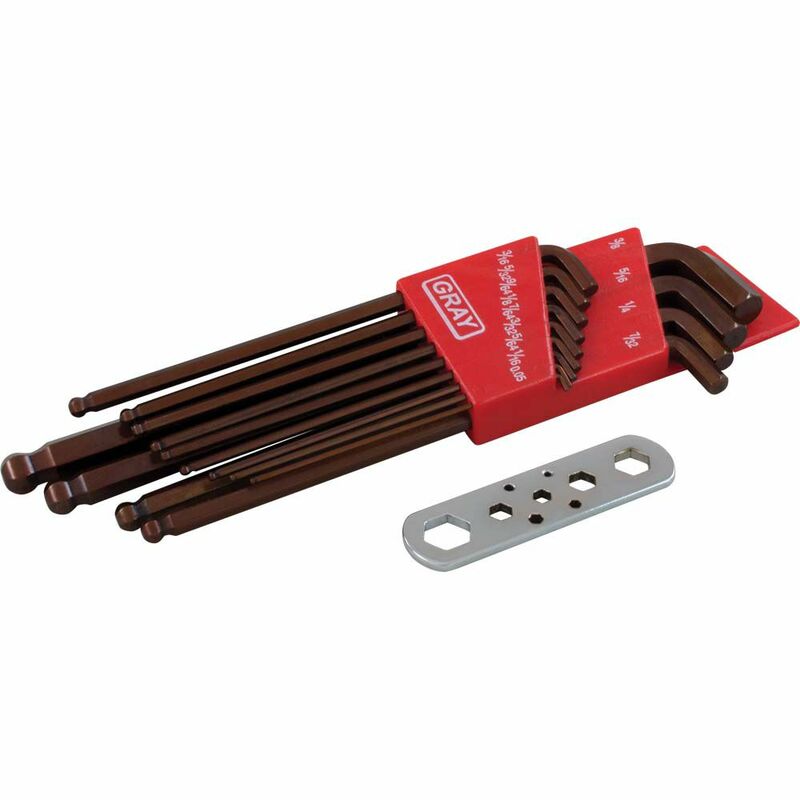 13 Piece Sae Stubby Long Arm Ball Hey Key Set The short ball end hex keys in this 13 piece SAE set are made from premium S2 steel for superior durability and corrosion resistance. Gray hex keys deliver up to 33% more torque than ordinary hex keys. Backed by Gray Tools worry-free lifetime warranty. 13 Piece Sae Stubby Long Arm Ball Hey Key Set is rated 5.0 out of 5 by 1. Rated 5 out of 5 by Andre from It's Gray product. Ecellent product. I'm certain that it will last me a life time. I have always prefer gray tools over any other brand because of the quality and durability.